I’m all about the Connected Home (as the title of this blog implies). My Living Room Home Theater system up until yesterday consisted of a circa 2010 Samsung 52 inch TV, an ancient Sony 5.1 Receiver, an Xbox 360 used solely as a Media Center Extender, a WDTV Live Hub which I used for DLNA Play To streaming, a Netgear PTV3000 for Miracast, an Apple TV for You tube, Hulu, Netflix, etc., a cable DVR and a first generation Samsung Blu Ray player. Separately, I have a pair of Sonos Play 5 speakers. A few days ago, the ancient Samsung Blue Ray player started groaning and screeching and it was the final incentive to replace it with something newer. I did some Internet research and decided that the Samsung BD-F5900 would certainly improve my movie experience several fold. I downloaded the user manual and was even more impressed. While Samsung is likely to have a replacement model any day now, the $99 on sale price (at Best Buy no less) and the local availability drove me out in the 2 degree weather to purchase the device. My intention was to replace an aging Blu Ray player, but what I got was a whole lot more. 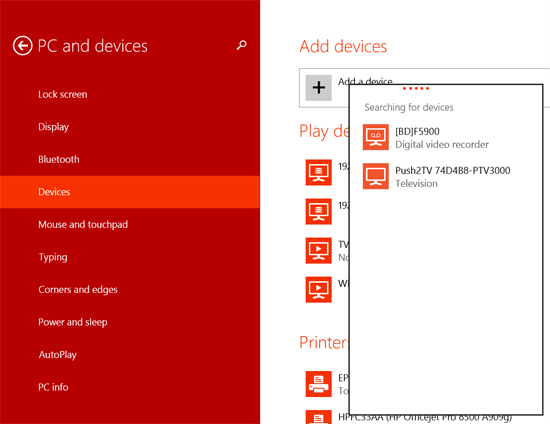 No where on the box, the device itself, or in the user guide does the term DLNA appear. The BD-F5900 works perfectly as a Play To target. HD movies even play across the network smoothly. I can now move the WDTV Live Hub out of my Living Room (it is still a great NAS device). The user guide mentions Samsung’s proprietary All Share multiple times, and mentions Miracast once. Miracast works perfectly. My Netgear PTV3000 can move upstairs to the bedroom TV or travel with me. I can also use my iPhone with the PlugPlayer App as a small remote controller (the manual refers to similar functionality only working with s Samsung branded phone). Last but not least, I had been using the Apple TV as a device to watch YouTube, etc. 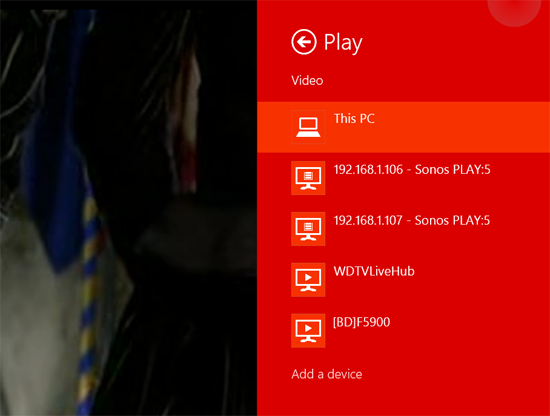 and not for Airplay of late (since the arrival on Miracast on Windows 8.1). I’d been watching some Amazon Prime Instant Movies on my Surface and using Miracast to display on the TV, (and didn’t have any app direct on a device that accessed this). Amazon is one of the apps available (along with 100+ others including the other big names like Netflix, Hulu, etc.) on the BD-F5900. Streams at 1080p HD smoothly and looks great. I’ll put the Apple TV away for now. Bottom line, I’ve now got one device that replaces three and have removed some of the clutter in my living room. In related news, there is rumor of a Microsoft Surface branded Miracast dongle via an FCC filing. Interesting development to say the least. It will be interesting to see what price point this launches with (if it launches). Stand alone Miracast adapters like Netgear’s PTV3000 and Actiontec’s Screen Beam are selling for $65-70. I guess I feel really good having purchased the Samsung BD player for $99 and getting everything but the kitchen sink included.